United States Supreme Court Justice Ruth Bader Ginsburg defended the use of foreign law by American judges at a symposium at the Moritz College of Law at Ohio State University not long ago. Her comments have spawned somewhat of a mild uproar, as not everyone agrees with her on this issue. Of course, if all one is doing is reading the wisdom of a judge from Germany, it isn’t so different from reading a law review article, and there is no reason not to read the German judge’s opinion. However, when one attempts to take the wisdom of a German judge applied to a case in a German court under the control of German law, and then apply it to a case in an American court covered by our Constitution and the laws enacted under it, we have entered into an entirely different realm. The court’s judicial conservatives — Chief Justice John G. Roberts, Jr. and Justices Samuel A. Alito, Jr., Antonin Scalia and Clarence Thomas — oppose the citation of foreign law in constitutional cases. Justice Ginsburg seems distracted by immaterialities, such as the fact that she is now the only woman on the Court. “I am there all alone, and it doesn’t look right,” she commented. But what the Court looks like is not at all important; what is important is the law, and the law of the land is the United States Constitution. 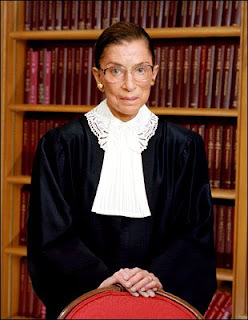 Justice Ginsburg is a judicial activist, and the problem with judicial activism is that it suspends the concrete judicial foundation set forth in the plain language of the United States Constitution in favor of a set of ideals based on personal opinion, changing social concepts and the emotional preferences of the moment. Liberals and activists euphemistically call this a “living Constitution,” which means that the Constitution doesn’t really mean what it says, it means whatever five of the nine Supreme Court Justices decide it means. Using Judge Ginsburg’s rationale, why not use the “wisdom” of judges in Zimbabwe, China, Venezuela, Cuba or Saudi Arabia? And if there were judges on the Moon, Mars and Jupiter, why not use their wisdom, too? It is such infidelity to the expressed intent of the Framers of our Constitution that has produced some of the most horrid legal decisions and interpretations in the history of the United States. Justice Antonin Scalia is a strong voice for the "originalist" interpretation of our Constitution, which means adhering to the meaning of its content when it was adopted. Justice Scalia is a judicial conservative who believes those who wrote the Constitution meant what they said and said what they meant. Justice Ginsburg, on the other hand, believes that revising the Constitutional interpretation to make it more "up to date" is the correct approach. Justice Ginsburg and other proponents of the “living Constitution” might believe that the Constitution means whatever their moral and political intuitions tell them advances the cause of human progress. Originalists believe the Ginsburg view is manifestly incompatible with the core tenets of our constitutional republic. American law is unique in its strong emphasis on solving important policy issues by the use of the rule of law. Our legal system and our Constitution become irrelevant if they are constantly subject to reinterpretation and revision every time popular opinion about important laws and social strictures changes. We simply cannot abide that sort of judicial philosophy.